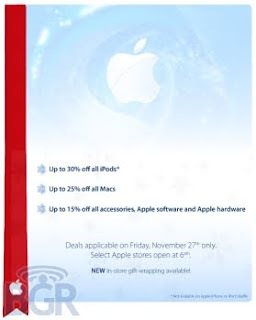 According to BoyGeniusReport on Nov 27th Apple will be offering up to 30% off on all iPods (excluding iPhone and iPod shuffle), up to 25% off Macs, and up to 15% off all accessories as well as Apple software and hardware. BGR reports that the info and the flyer posted on their site was leaked by an Apple insider. The flier (pictured below) doesn't show much for details, but what is there, if legit, is fairly juicy. The sale is a one day only deal November 27th with "select" stores opening early. 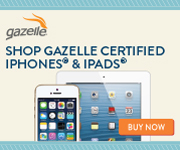 For more deals on iPods, Macs and other Apple products checkout the MacMall 96 Hour Apple Sale! and get free engraving, a free charger and free Case, with all iPods after mail-in rebates. Its good deal for everybody. Also this time , in 2009 black Friday people expect more discount and sale on different things. Because now a days economy of the world is not going good so people are facing recession problem. So sale and discount really very important for people during shopping on black Friday.